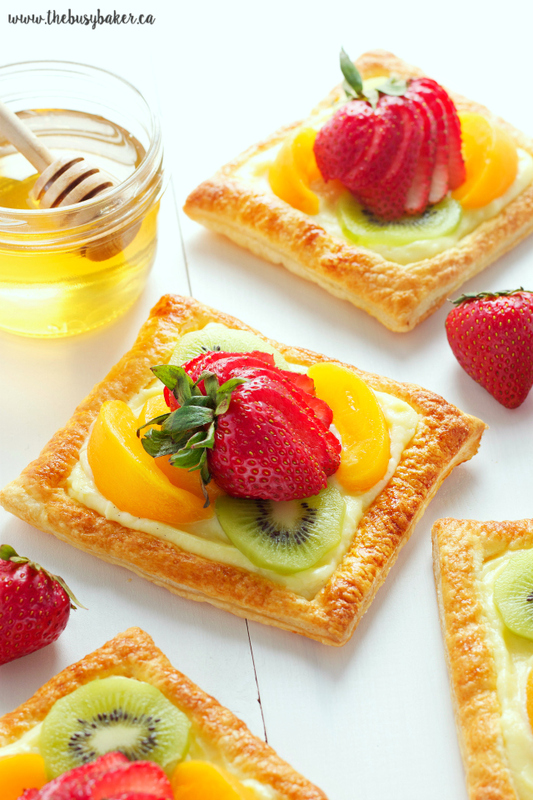 Custard fruit tarts like these Honey Glazed Fruit Tarts with Vanilla Bean Custard Filling are a delicious sweet treat for summer! 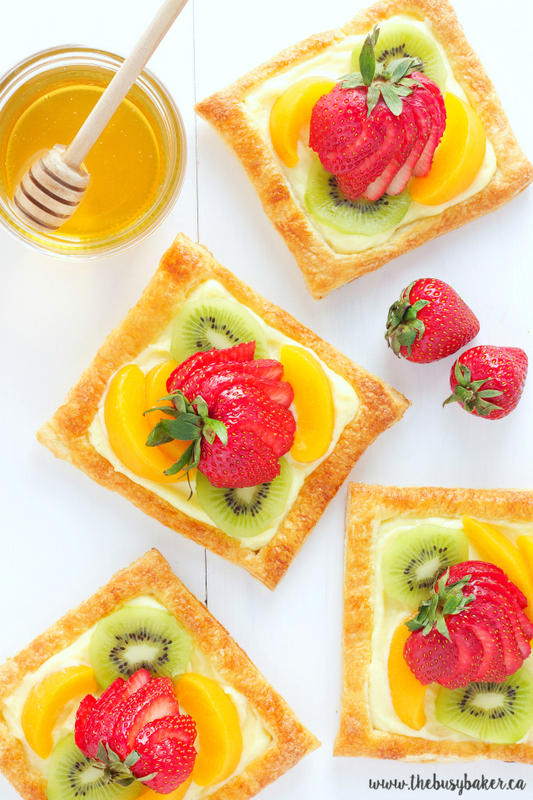 The individual fruit tarts feature fresh seasonal fruit with a sweet honey glaze and an easy homemade vanilla bean custard. 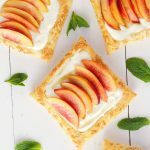 They’re a gorgeous dessert and they make a beautiful addition to any brunch buffet! 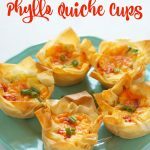 Looking for more summer recipes? You’ll love this Almost No-Bake Cheesecake or these Cherry Cheesecake Popsicles! Do you ever have those days in the kitchen where you feel endlessly creative, like you could accomplish anything? For me, days like that don’t come very often but when they do it is a beautiful, beautiful thing. Being a food blogger I have more than my fair share of recipe flops. 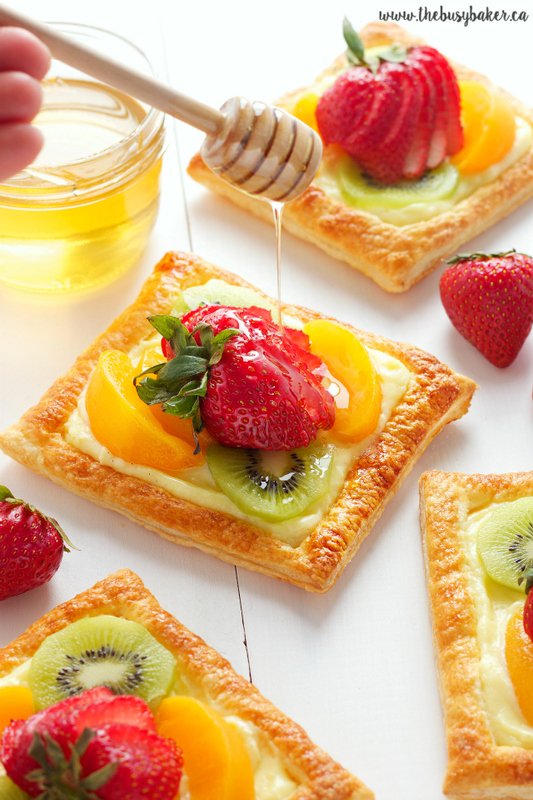 But the other day I looked in my freezer, saw a package of frozen puff pastry and all of a sudden these Honey Glazed Fruit Tarts were born. It was a glorious day in my kitchen, and let me tell you – these tarts are to die for! I’ve always admired beautiful, intricate laminated dough pastries like croissants and puff pastry, and the chefs who make them. I live just down the street from a french patisserie and aside from the temptation it is, it’s always inspiring to study their pastries…how do they get all those gorgeous flaky layers?? I’ve attempted homemade pastries with laminated dough a few times and I’m happy to say it wasn’t a total disaster, but it certainly didn’t look quite as good as anything I’ve ever enjoyed in a bistro or bakery (and believe me, I’ve had my fair share of pastries!). If you’ve been around here for any length of time you’ll probably know that I try my best to cook and bake from scratch as much as possible, but today…we’re using frozen puff pastry because, let’s be honest, sometimes it’s just easier. If you’ve ever made homemade puff pastry you’ll know how hard and labour-intensive it is and with two little ones running around, I just don’t have time for that at the moment. One day I will…but not today. made homemade custard before, just follow my tips and you’ll be just fine! It’s a lot easier than it sounds. 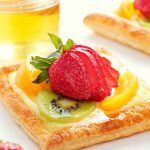 These custard fruit tarts are just gorgeous and they’re a great, easy way to wow your brunch guests or impress your friends at a casual summer dinner party. And feel free to customize the honey glazed fruit to your own tastes! 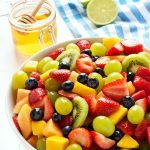 I love peaches, strawberries and kiwi at this time of year but you could use nectarines, blueberries, blackberries, oranges, grapefruit, or any other fruit you’d like! Looking for more fruity recipes? Try these Strawberry Swirl Cupcakes with Fresh Strawberry Buttercream or this Berry Walnut Spinach Salad with Maple Vinaigrette! 1 vanilla bean 2 tsp vanilla bean paste or vanilla extract works too! Using a pizza cutter (or a pastry cutter if you're lucky enough to have one), cut the sheet of puff pastry into 4 squares equal in size and shape and arrange them on the prepared baking sheet with ample space between them. Use the pizza cutter again to slice a smaller square inside the larger one, creating a 1.5cm border around the edge of each piece of the puff pastry dough. Be careful not to slice all the way through the dough - just about halfway through the thickness of the dough. Beat the egg and the 1 tbsp of water and brush the borders of the puff pastry dough very lightly with this mixture. You'll have tons of the egg wash left over...don't overdo it, or you'll end up with very egg-y edges. When you take them out of the oven, immediately push down the middle square lightly with the back of a spoon or fork. It will probably have risen up a bit during baking and it's important that it's lower than that beautiful border you've created. Once the milk has reached a simmer, remove the vanilla bean pod and pour the milk extremely slowly into the egg yolk mixture, making sure to whisk continually while adding the milk. This method is called tempering - adding the milk slowly while whisking brings the temperature of the egg mixture up slowly so they don't scramble. Continue adding the milk slowly until everything is combined. Add the butter to a separate bowl and place a sieve over that bowl. Once the milk/egg mixture has thickened, pour it through the sieve over the butter and press it through with a spatula. You may notice a few small chunks of cooked egg in the sieve - this is totally okay! As my favourite Canadian pastry chef Anna Olson always says, "Pastry chefs ALWAYS strain their sauces!" and for good reason! Grab your whisk and whisk the custard and the butter together just until combined. Cover the mixture with a piece of plastic wrap, making sure the plastic wrap is directly covering the surface of the custard. This may seem like a weird step, but it prevents that yucky custard skin from forming on the surface while it cools (and nobody wants that!). Cool the custard in the fridge for a few hours until it's completely cool. To assemble the tarts, just divide the custard evenly between the 4 puff pastry tart shells you've made and spread it smoothly into the base. Add your sliced fruit on top in whatever formation you wish. Whisk the liquid honey with a few drops of water, just to thin it out a tiny bit. 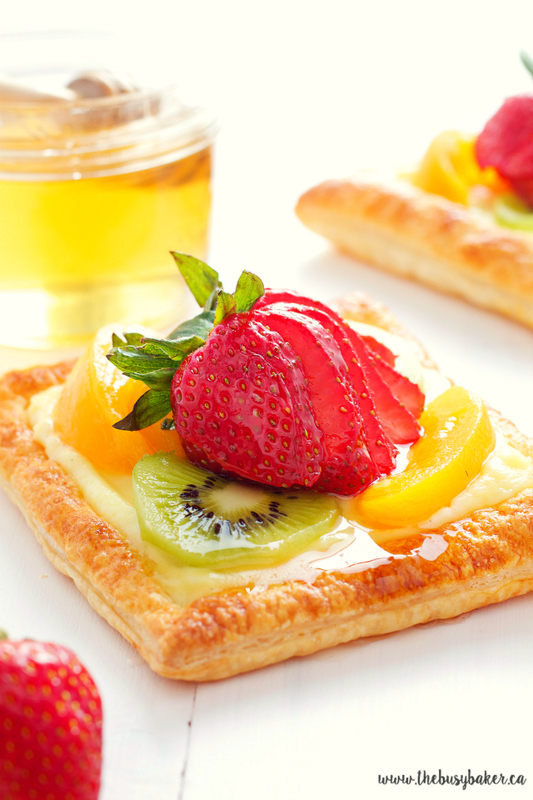 Brush it over the fruit with a pastry brush to create a sweet, shiny glaze! The great thing about this recipe is that the custard has such a neutral flavour that really any fruit would work! Try blueberries, blackberries and strawberries, or your favourite citrus fruits. Anything goes! 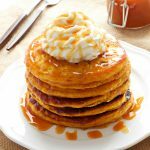 Serve with a cup of tea for a delicious treat, or double the recipe to add to your next brunch buffet! 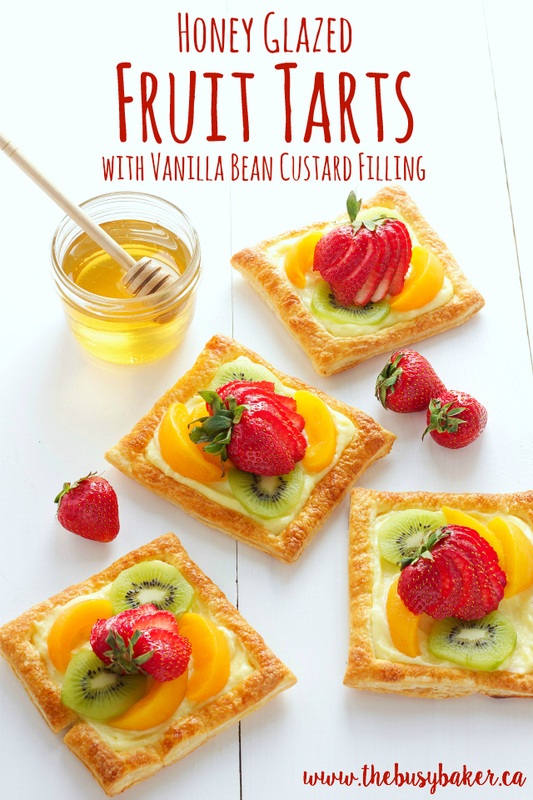 I really hope you enjoy this custard fruit tarts recipe! Let me know in the comments below, what’s your favourite seasonal fruit this time of year? Wow! These look so amazing! I am going to have to try these. This is my first time stopping by and I sure am glad I did. I am pinning these for later. Thank you for posting! Thanks so much! I hope you enjoy them!! This is a gorgeous dessert! 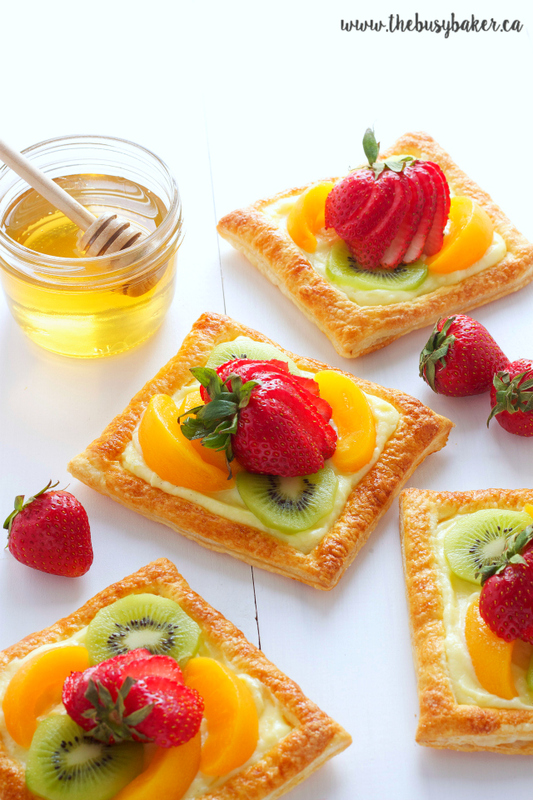 Tarts are one of my favorites! These turned out great and were so good! The honey I had on hand was very strong, even after adding some water, so I opted to add water to some leftover lemon curd for use as the fruit glaze. It was a good move. What a great idea! I'm so glad you enjoyed them! !